In the recent past, there has been a shift in demand from traditional fiberboard cartridges to plastic cartridges as most of the lubricant manufacturers across the globe are opting for plastic cartridges. Such transformations are due to high paperboard prices, which are generally used for manufacturing fiberboard cartridges and durability concerns related to the product. Furthermore, plastic grease cartridges have been witnessing growing preference in past few years due to their rigid structure, which reduces the risk of leakage, as in the case of fiberboard cartridges. Plastic cartridges are climate resistant and can also reduce the leakage of grease from fiberboard cartridges during logistics and shipping. The demand for plastic grease cartridges is expected to increase over the forecast period. The increasing applications of grease cartridges in after-sales services, especially in automobile and mining industries, have created lucrative opportunities for manufacturers worldwide. The automotive sector accounts for more than 50% of the total lubricants market across the globe. Increasing automobile production lifts the need for lubricants on a large scale. Apart from consumer preference, another important factor which is expected to play a crucial role in driving the growth of the greases market is the widespread range of industrial applications. Grease cartridges reduce efforts employed in manually applying lubrication grease on anti-friction bearings, vehicle chassis, and automotive intersections. In addition, grease cartridges made up of plastic are getting traction as it gives better leakage protection as compared to fiberboard grease cartridges. On the basis of capacity, grease cartridges market is segmented into 3oz, 14oz, 14.1oz and 14.5oz. Among these, 14oz grease cartridges segment accounts for the largest market share in the global grease cartridges market. Based on material type, grease cartridges market is segmented as up to plastic and fiberboard. While plastic segment is further sub-segmented into HDPE and PP. Plastic is expected to dominate the market during the forecast period. By the closure type, the grease cartridges market is segmented into pull-off cap, piston cap, flat cap, and spouted cap. Research indicates that the pull-off cap segment will continue to dominate the market for global grease cartridges through 2026. Constant technological developments have led to augmentation in grease quality, and to a large extent, is influenced by the global impulsion for the use of bio-based products. The same has had a direct impact on the growth of the grease cartridges market. In developed countries such as the USA, Canada, and countries of Europe region, thereby contributing significantly to the growth of the global grease cartridges market. The APAC region is estimated to account for the largest share in grease cartridges market due to increasing need for lubricants for automobile industry in this region. The MEA region is estimated to contribute small but rapidly growing market share in grease cartridges market. Growth in grease cartridges market in Latin America region is expected to be moderate during the forecast period. A few of the key players in the global grease cartridges market include Fischbach KG, MBP Manufacture Bourguignonne de Plastique, Biederman Enterprises Ltd., Sonoco Products Company, Tubi System AB, Schieferdecker GmbH & Co. KG, Plastic Tooling Manufacturing Pty. Ltd., Long Thames Enterprise Co., Ltd., Andpak Inc., and Bev-Cap Pty Ltd.
Transparency Market Research examines the global grease cartridges market during the forecast period 2018-2026. The primary objective of the report is to identify opportunities in the market and present updates as well as insights about various segments of the global grease cartridges market. 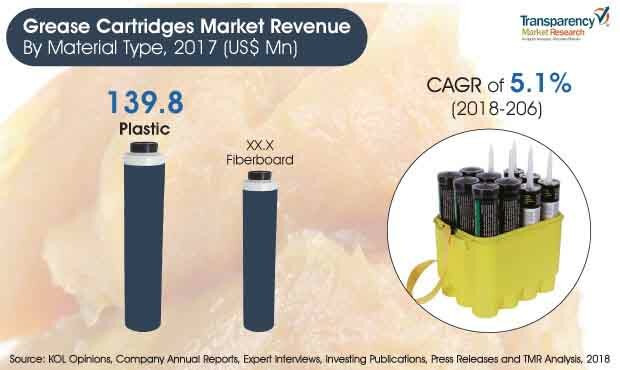 The report begins with an overview of the global grease cartridges market, evaluating market performance regarding revenue, followed by TMR’s analysis of key trends, drivers and restraints witnessed in the global retail as well as grease cartridges market. Weighted average pricing analysis of grease cartridges market is based on product type is also included in the report. To compute the market size, in-depth secondary research is done. Data points such as regional splits and market split by capacity, material type and closure type have been assimilated to arrive at the market estimates. The report comprises the forecast of the global revenue generated by sales of grease cartridges across the retail industry. Market numbers have been estimated based on extensive secondary and primary research, average pricing of grease cartridges market by product type and the revenue is derived through regional pricing trends. Market size and forecast for each segment have been provided in the context of global and regional markets. The grease cartridges market has been analyzed based on expected demand. Prices considered for the calculation of revenue are average regional prices obtained through primary quotes from numerous regional grease cartridges manufacturers, suppliers, and distributors. All key end users have been considered and potential applications have been estimated on the basis of secondary sources and feedback from primary respondents. Country demand patterns have been considered while estimating the market for various end users of medical device labels in the different regions. Bottom-up approach has been used to estimate the grease cartridges market by regions. Global market numbers by capacity, by material type, and by closure type have been derived using the bottom-up approach, which is cumulative of each country’s demand. The same has also been validated from top-down approach. Company-level market share has been derived on the basis of revenues reported by key manufacturers. The market has been forecast based on constant currency rates. TMR triangulates the data via a different analysis based on the supply side, demand side, as well as dynamics of grease cartridges market. TMR not only conducts forecasts in terms of value but also evaluates the market on the basis of essential parameters, such as Year-on-Year (Y-o-Y) growth. This helps providers to recognize the future opportunities as well predictability of the market. In order to understand and assess opportunities in this market, the report is categorically divided into four key sections on the basis of capacity, by material type, by closure type and region. The report analyzes the global grease cartridges market in terms of value (Thousand US$) and volume (Thousand Units). Vital feature of this report is the analysis of the global grease cartridges market by region, product type, capacity and sales channel; and the corresponding revenue forecast in terms of absolute dollar opportunity. This is traditionally overlooked while forecasting the market. However, absolute dollar opportunity is critical in assessing the level of opportunity that a provider can look to achieve as well as to provide potential resources from sales perspective of the global grease cartridges market. To understand key segments in terms of their growth and performance in the grease cartridges market, Transparency Market Research has developed a market attractiveness index. The resulting index should help providers identify existing market opportunities in the global grease cartridges market. In the final section of the report, grease cartridges market competitive landscape has been included to provide a dashboard view of companies that manufactures grease cartridges. The report contains company profiles of some of the players in the grease cartridges market. Few of the key players in the global grease cartridges market include Fischbach KG, MBP Manufacture Bourguignonne de Plastique, Biederman Enterprises Ltd., Sonoco Products Company, Tubi System AB, Schieferdecker GmbH & Co. KG, Plastic Tooling Manufacturing Pty. Ltd., Long Thames Enterprise Co., Ltd., Andpak Inc. and Bev-Cap Pty Ltd.